Gilbert Frankau joined up as soon as the war began, leaving his family cigar business to fend for itself. The facts are easily abbreviated thus: “First commission 9th East Surrey Regiment, [9 October] 1914; transferred to Royal Field Artillery, 1915; appointed Adjutant to 107th Brigade, R.F.A. ; and proceeded overseas in that capacity; at Loos, Ypres and the Somme; promoted Staff Captain for special duty in Italy, Oct., 1916; invalided from the Service and granted rank of Captain, Feb. 1918” (Self-Portrait, 183). He wrote for the informal soldiers’ newspaper, the Wipers Times. He published two volumes of war poetry with Chatto & Windus (The Guns in 1916 and The City of Fear in 1917) and in 1917 he also published his first prose novel, The Woman of the Horizon: A Romance of Nineteen-Thirteen. At one point when he was in France, he occupied the same billet as John, Rudyard Kipling’s son. Our involuntary landlady and her peasant husband had adored John. 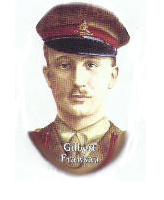 My brigade wire had been the first to report him missing when the Irish Guards charged Hill 70. Something impelled me to write these things to the man whose genius I had so long worshipped from affair. Rudyard Kipling answered me with his own hand, marking his letter, as was his custom, “Private”. Thus began a correspondence of which—as you will hear later—only one piece on literary criticism on his part appears to survive (Self-Portrait, 185). He went on leave over Christmas 1915, crossing the Channel in a storm on Christmas Eve. He visited his aunt Eliza in Fitzroy Square, Bloomsbury. Isidore de Lara, one of the dearest men who ever lived, and so handsome in his youth that a princess left her consort for him, had arrived on a push-bike. He shook me warmly by the hand after detaching his trouser clips. H.G. Wells looked me over as though I were a specimen out of a bottle. Fortunately I stood in no awe, though I had enjoyed some of his earlier tales, notably The Time Machine. “One rides occasionally”, said I, pitying his ignorance. He’d never kicked an unclipped hairy over a wet ditch under shellfire. He admitted that gunners sometimes rode, but suggested that I had not arrived at Fitzroy Square on horseback. I was tempted to tell him that I found his Tono-Bungay too long, and been bored with his New Machiavelli but refrained. I believe he added “Wearing your spurs”, but of this I am not quite certain. All I know is that I was not liking him. One did at least expect some decency, some understanding from a civilian. My maturity allows that he may have spoken in jest or merely to show his own cleverness. But that H.G. Wells spoke these words is indubitable. […] They hurt my youth beyond all anger (Self-Portrait, 187). Frankau was sent to Italy in October 1916 as a staff captain to counter German propaganda against Britain: he organised an effective press and film campaign, although, he said later, that the British Military Mission in Udine, “do not altogether approve of my ten months’ single-handed effort to educate the Italian civil population by films, by press propaganda, and by personal appearances complete with artillery sword and white gloves” (Self-Portrait, 204). The language of the period had not bowdlerised the single word which is supposed to be used as a term of endearment among sailors into “adjectival brass hat”. The general who was sharing my cabin smiled. “I am afraid that I am that b——— Delme-Radcliffe”, he said. “Let’s have a drink.” (Self-Portrait 195-196). While Frankau was in Rome, organising a film showing, he was staying at the Grand Hotel, and so was Rudyard Kipling. For the first, last and only time in my whole life, I felt shy. I blushed. I stammered, Words nearly failed me—but not quite. Afterwards, when he had put me at my ease as only he could, I said, “You didn’t mind me writing to you from Acquin. I simply had to. [See above.] You see, I know every line you’ve ever had printed. I believe that if every one of your poems were destroyed, I could rewrite them by heart. Kipling said, “What evidence of a misspent youth”. Secretly, I could not help comparing him with Wells (Self-Portrait, 200). Frankau was invalided out of the army on 22 February 1918 because of the continuing effects of shell shock. He had insisted to the medic that he was all right, and was told: “Report for duty if you insist. You’ll never be sent to the front; but you will eventually be sent to the shell-shock hospital at Craiglockhart. It’s a nice place—if you like fellows jumping head first from the top storey on to the terrace just while you’re having your after-breakfast stroll there” (Self-Portrait, 208). His cigar business had by then gone bust, and he turned to writing as a career. Frankau’s war poems, which can be found here or here, are not as well-known as the more-lauded poems of Sassoon or Owen. In part this is because some of them, displaying his hatred of the enemy, do not fit in well with our ideas of war poetry or the sensibilities of the twenty-first century. But there is a lot of vigour there, and some of them — for instance, “The Other Side”, which is written as by an officer to a former subaltern who has written some rubbishy poetry which displays no memory of his time in the trenches — are rather trenchant satire. That seems to please the idiots at home. My information comes mostly from the entry in the Oxford Dictionary of National Biography written by R.J. Minney (revised by Clare Taylor), supplemented by Frankau’s own Self-Portrait: a Novel of His Own Life (London: Hutchinson, 1940).